Publishing a manuscript can be a complicated process, but Enago can simplify it for you. We offer high-quality editing by native English-speaking subject experts to enhance your chances of publication success. Our experts will assist you at each stage of your publication journey and ensure that your manuscript adheres to your desired journal's guidelines. You can leverage the benefits provided by Enago's end-to-end author support services in order to save valuable time and effort and get published in international journals. Getting published in high-impact factor journals will also help increase your university’s research output and impact. Research authors that require only a basic round of language and grammar checks should select Enago’s Language Check editing service. This rapid service includes a high quality top-level review of content for clarity, accuracy and readability by an expert academic editor. Enago’s Copyediting service is designed for researchers who require a 100% Language Accuracy on their manuscripts. This two-stage process, carried out by an expert editor and proofreader, covers everything from spelling and grammar to accuracy, including adherence to journal guidelines. Substantive Editing, Enago’s premium service, focuses both on the English language and on overall presentation, logical flow and structure. It is matched with our highest ranking and most experienced academic editors, and offers additional quality assurances including 365 days unlimited editing. Fill out our quote form, and we’ll get back to you within an hour. End-to-end support by Enago to make your manuscript ready for publication. 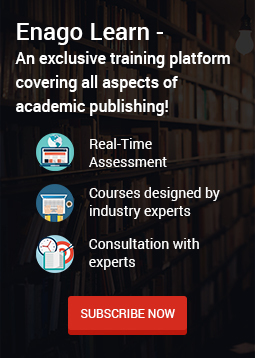 Enago’s academic publication support packages offer timely assistance every step of the way. From helping you select the right journal to assisting you in writing a compelling cover letter. Participate in academic workshops designed to support early-stage researchers and faculty staff.